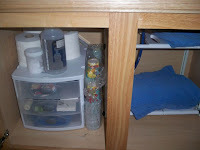 Over the last few months many things have been left undone around the house and it now badly needs to be de-cluttered. I'm feeling more myself and wanting to get the house back in order, but still wanting to take it easy, enjoy my new baby, and enjoy the holiday season with my kids. I figured I'd just start slowly and see what I can get done while trying to keep up with the regular things that need to get done too. I started with the bathrooms this week. I figured it would be more encouraging to me to spend a little bit of time in a place that my effort would show the most. Too many things had just been left sitting/hanging around in my bathroom. 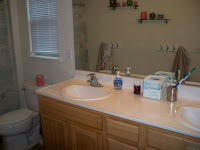 In only 15 minutes my bathroom was looking great! Miss J helped me clean up, and Mr. S helped me clean out the bath toys! We replace the regular towel racks that our houses always have with rows of hooks for towels. This has been a great way to handle the many towels we have, I got this idea from an e-mail loop for large families that I'm a part of. 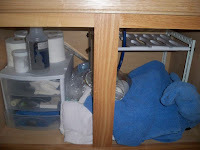 Later I organized the space under the kids' bathroom sink. This only took me about 4 minutes with Miss J's help, but it made a big difference. After doing our morning chores and a bit of school Miss E asked if we could watch "the fourth wise man" and do nails, so that is what we did. Since the boys' can't do their nails they sometimes ask to do mine. This is what happens when 4 and 6 year old boys get a hold of their sisters nail polish and do Mommy's nails! They were so cute when they were doing them. They knew what colors they wanted and worked so hard to make them look nice.